A high-ranking official defected Friday from the Democratic United Party amid growing factional fighting in the lead up to Saturday’s leadership election. Moon Sung-keun, a former Supreme Council member and a key figure in the mainstream pro-Roh Moo-hyun faction, announced his departure on his Twitter account. “I am leaving the DUP. I am sorry that I was unable to tell the many people who supported and guided politician Moon Sung-keun,” the movie actor-turned-politician said. Moon is a ranking member of the organization Power to the People, whose aim is to bring the opposition parties into a lasting alliance. Although Moon did not elaborate on his reasons, Moon’s departure is seen by some as a sign of a deepening rift between the pro-Roh group and smaller factions. 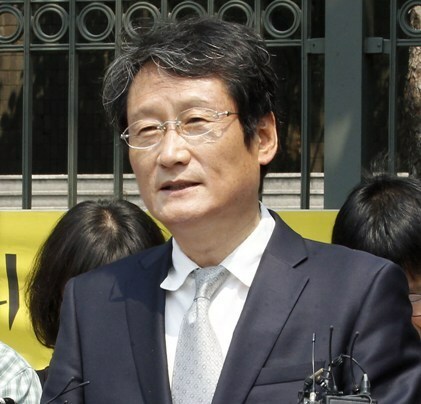 Moon’s decision comes three weeks after Myeong Gye-nam, actor and a staunch pro-Roh figure, left the DUP in protest of the party’s blaming of pro-Roh figures for its defeat in last year’s presidential election. In addition, the party has been accused of abandoning its progressive ideals after a revised party doctrine was proposed on April 22. While the DUP’s identity crisis deepens, party chairmanship campaigns of Reps. Kim Han-gil and Lee Yong-sup have been marred by allegations of illegal campaign activities. Kim, one of the most prominent of DUP’s nonmainstream figures, has called in his campaign to eliminate factionalism and is considered to be leading the race. Lee is considered to be a member of the party mainstream, and has the support of the pro-Roh faction. According to Lee, Kim’s campaign aides have called DUP members, urging them to vote against him. “I personally think that if Lee Yong-sup becomes the party chairman, he will be controlled by Lee Hae-chan from behind the scenes. So, Lee Yong-sup cannot be elected,” a Kim campaign aide was recorded as saying in a phone conversation with another aide. In addition, Kim’s campaigners have also been accused of attempting to make it appear as though Kim had the support of the DUP’s regional council chiefs by including their names in text messages promoting his campaign. For his part, Kim has accused Lee of attempting to defame him, and the pro-Roh faction of influencing the election, saying that calling and texting voters was not banned by the party’s election committee. Kim’s aides, however, have apologized for mentioning Lee Hae-chan by name, and that they were looking into the allegations.